DAPlog Plus for Windows is legacy software superceded by DAP Measurement Studio (DAPstudio). While DAPlog remains useful for system testing and simple data logging configurations, most applications need the full configuration support that DAP Measurement Studio provides. DAP Measurement Studio (DAPstudio) provides user interface features without requiring any Windows programming. DAPstudio also offers a rich development environment: it presents you with each software tool you need at the very moment you need it, at every stage in the development process. DAPstudio lets you develop applications quickly and easily, using the full DAPL command set. In most cases you really need no other software to develop and run any application. DAPlog Plus for Windows, like DSCview, works with DAPcell server-side disk-logging to deliver a ready-to-run application that logs acquired data to disk continuously at extreme speeds. This easily installed application requires no programming of any kind, and scales directly with each added PC. 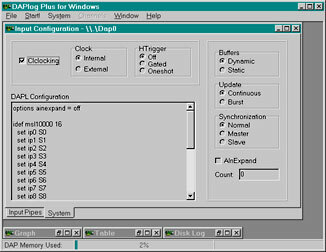 DAPlog, running on a PC under Windows, provides a standard way to implement a data acquisition application on a Data Acquisition Processor board without doing any Windows programming. DAPlog Plus should be used in addition to DAPview for Windows, based on what you want to achieve. DAPview for Windows controls the DAP board by sending it DAPL commands that you explicitly specify. DAPlog Plus also controls the DAP by sending it DAPL commands. With DAPlog Plus, however, you implicitly specify predefined sets of commands simply by navigating a graphical interface. The actual DAPL commands remain out of sight. To get an idea of how DAPlog works, review these sample applications. DAPview for Windows lets you send any DAPL commands to the DAP. For this reason, choose it over DAPlog Plus if you need to process data on the DAP itself. Customers with no processing requirements, who only want to view their sampled data or log that data to disk, should use DAPlog Plus over DAPview. Simple to use, DAPlog Plus takes little time to get the DAP up and running. DAPlog Plus also displays the data in a graph and table, and logs the data to disk, much more efficiently. For software for iDSC 1816 boards, see DSCview.